Stray from the Heart’s international rescue and adoption program, called Compassion in Action, began more than 15 years ago in Puerto Rico. Its continued success is made possible by sponsors and dedicated international volunteers who, like us, believe all Strays deserve to be rescued, regardless of where they are born. Through an established network in Puerto Rico, Ecuador and other countries in South America, we have rescued, rehabilitated and found loving homes for more than 1,500 street dogs from around the world. In an island of just 3 million people, there are close to 500,000 neglected and abandoned dogs roaming the streets and beaches of Puerto Rico. Known as “Satos”, these dogs are abandoned by the side of a road, or dumped by the beach to fend for themselves. Many die of hunger and dehydration, while others contract mange and intestinal conditions. They suffer from thirst, hunger and loneliness. Our volunteer partners in Puerto Rico rescue and care for dozens of wonderful Satos until they are strong enough to travel to the U.S. and are matched with the right home. In Ecuador, we partner with Camino a Casa (Path to Home), a volunteer-run organization based in Quito, where it is estimated more than 300,000 Strays roam the streets. Without our help, these abandoned and abused “Ecuadogs” have little chance of survival. Numerous international programs as far as India have contacted Stray from the Heart to set up similar programs, and we hope to extend Compassion in Action with increased funding and volunteers. We are deeply committed to animal welfare, international public health initiatives and animal awareness campaigns that educate people about the perils of street dogs and urge them to take action. 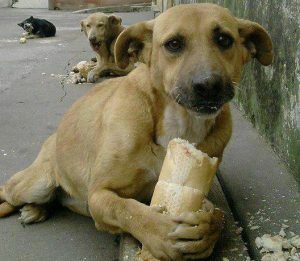 To see the grim conditions these street dogs face, please watch our slideshow. WARNING: These images are graphic and may be disturbing. Viewer discretion is advised. Read A Prayer from a Stray.